Aircraft Picture - This image of the Merganser taken from a Percival Aircraft brochure, c. 1947. The Percival Merganser was a light, civil transport of the late 1940s. It was a twin-engine, high-wing monoplane of all-metal, stressed skin construction with retractable tricycle undercarriage. 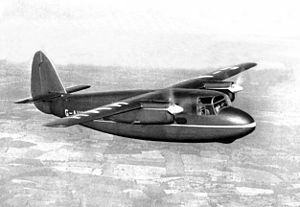 The Merganser was designed as a five-passenger, light airliner with an emphasis on "passenger appeal". To this end, a high-wing configuration and tricycle landing gear were chosen to provide the best view and a low, level floor for easy access. The fuselage, having been completed in November 1946, was shipped by train ferry to Paris to be displayed at the Aero Show. By this time, the Merganser was already doomed, since it was designed to be powered by de Havilland Gipsy Queen engines and neither these nor any suitable substitute were available. Only one Merganser was flown; when it made its first flight on 9 May 1947 from Luton Airport, the engines were on loan from the Ministry of Supply. The company was able to carry out extensive flight trials and obtain much valuable data. Although it appeared at the SBAC Show at Radlett in September 1947, it was scrapped at Luton in August 1948. A second Merganser was used as a static and structural test airframe. Although the Merganser never entered production, further development, based on the data gathered from its test programme, would lead to the larger Prince, President and Pembroke series for which a suitable powerplant was available. Data from British Civil Aircraft since 1919, Volume III.